One of the latest, highest yielding courgettes, yet bushy and compact-growing, producing delicious, shiny, dark green fruits approximately 18-22cm (7-8½") in length. Tolerance to Powdery Mildew makes it suitable for later cropping. Maturing time approximately 12 weeks from sowing. A compact & high yielding courgette! Sow late March to mid May, harvest July-September. 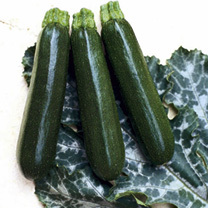 For maximum production of courgettes on all F1 varieties it is essential that all fruits of a culinary size are removed three times a week whether required or not. HEALTH BENEFITS - High in vitamins A (For growth, healthy hair, skin, bones, teeth, and eyes as well as resistance to respiratory infections), C (Anti-ageing, wound healing, decreasing blood cholesterol and prevention of infections. Assists the body in absorbing iron), and E (Antioxidant important for anti-ageing [particularly for skin]). ANTIOXIDANTS: Term used to describe a number of organic substances such as vitamins A, C & E, the mineral Selenium and 'Carotenoids' - the pigments which colour many fruits and vegetables. Antioxidants are thought to help prevent cancers, heart and stroke problems by assisting in the 'mopping up' and expulsion from the body of substances known as 'free radicals' which can be created by exposure to various environmental pollutants. COOKING HINT - Do not remove skins, just slice and grill, stir-fry, boil lightly or use raw in salads. Serve with chopped mint and balsamic vinegar.